Ahhhhh Ahuriri, where people from all walks of life unwind while feeding the body, mind and soul through healthy food information, consultations and choices to eat. Ahuriri has become a destination because of its great community vibe, simplicity, natural beauty, peacefulness, fun and customized service. It is refreshing to be by the sea every morning, the atmosphere is inspiring, the people in all the shops and businesses are lovely and the village is out of the hustle and bustle. As well, the village is easily accessible to people of all ages – via the beach, the pathway (walk or bike), free parking or the bus. 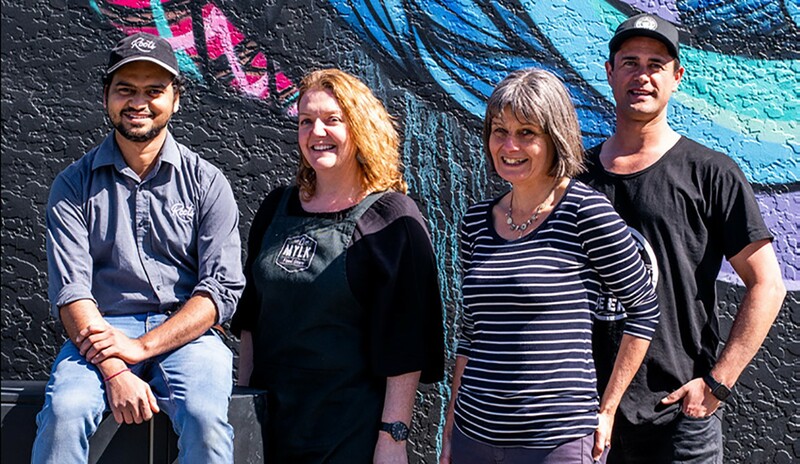 Four new businesses, opened by entrepreneurs passionate about healthy food and their customer’s experience of food, have been attracted to Ahuriri: Healthy Eating, Roots, MYLK and Mexi Mama. Food is well recognized as more than fuel for the body. It is central to culture, social life, comfort, health and the economy. With Hawke’s Bay as the food bowl of New Zealand, much more is possible. Healthy food choices can get complex, as anyone knows who has researched what impacts the way their body feels or performs. Every cell has DNA and chemistry and it’s individual to each person. The convenience of healthy options in the Ahuriri Village, saving people time, is special. Phillipa helps people find the foods that make them feel well, energized and high functioning through each age and stage of life. Sometimes simple food changes can have huge benefits for mind and body health. Healthy Eating, conveniently situated in the Ahuriri Pharmacy, helps people understand the power they have for taking charge of their own health through food. Roots makes their own almond milk and buys only organic coconut water as the base for all smoothies. They use plant based sweeteners including maple syrup and dates to avoid processed sugar. How could you resist smoothies called Cacao Delight, Hail Kale, Pink Dragon and Mad Mango?! Or smoothie bowls that taste just like ice cream? With regular customers from Havelock North and Hastings, who just can’t get enough of these smoothies, Roots is a destination in Ahuriri. Kristy Isaacson opened MYLK in Ahuriri to provide fresh, healthy takeaway meals – including special diets and meals for one – using high quality, New Zealand ingredients. As a professional chef for 20 years she wouldn’t have imagined putting her creations in a box. However, as a wife and mother, in addition to her entrepreneurial dream, Kristy understands the need for convenient and healthy food. Imagine different mains, desserts and salads each night with minimal planning, shopping, preparation or clean up. Menus change each week. She describes an initially gun-shy customer coming back with bright eyes, looking healthier and happy – that makes it all worthwhile. Each of these businesses recognizes customers are unique and appreciate being treated as individuals, listening to their needs and accommodating as best possible. They all see Ahuriri as a community where openness and individuality are central to the buzz and eclectic is appreciated. The owners collaborate with their neighbours, suppliers and each other to make the best possible service and products available, referring their customers to help meet each customer’s total needs. They are shocked when the ‘old-style’ competitive and protective behaviours show up. By creating a cluster with a common philosophy about food, service, people and business, these four have raised the bar for food and health, making quality living and individual service the most important elements. And where better to cluster than a setting that offers a relaxed and rejuvenating vibe … Ahuriri.